Solid surface is an extremely versatile countertop material in design and application offering a host of performance and aesthetic benefits. 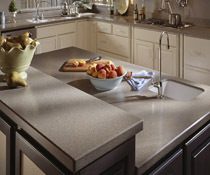 A hard, non-porous material, solid surface is a blend of natural minerals and high performance acrylics. 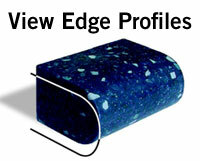 Because it uses bonded integral seams, joints appear almost invisible and are impervious to moisture. In addition, solid surface can be custom cut and bonded to fit nearly any surface shape. It can be formed, inlayed, carved, routed, and thermoformed (heated and shaped) for decorative edging, inlays, borders, trim, etc. 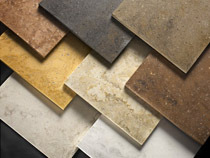 It’s also the most forgiving countertop material on the market. Since the color and pattern is uniform throughout the product, scratches, chips and stains can be sanded out and the surface “renewed” - reconditioned and restored - to its original finish. You can cook, spill, clean, raise children, actually live in your kitchen without worry. Marvic Corp. features solid surface from two of the leading brands in the market, DuPont™ Corian® and LG HI-MACS. Corian® is the original solid surface invented over 40 years ago and the most famous name in premium custom countertops. Has a rich, natural translucence, like fine stone, but a warm, inviting touch, like wood. Offers virtually limitless possibilities for patterns, colors and shapes. Stands up to the hard knocks life can dish out, and with proper care, will stay as beautiful as the day it was installed. Doesn’t just look clean, it really is clean; it doesn’t have pores, seams or voids like tile, wood, granite or marble, so bacteria and mold have nowhere to form. Is easy to clean, and since it’s non-porous, liquids won’t penetrate and stains won’t set. Survives the nicks and cuts that ruin most surfaces, and is renewable with ordinary abrasive cleaners or sandpaper. Won’t dent, crack or shatter like other surfaces. Has been satisfying homeowners around the world for more than 40 years. For 10 full years, if any piece of Corian® is found to be defective, it will be replaced at no cost, including removal of the old and installation of the new material. If a DuPont™ Certified Fabricator/Installer installs your Corian®, the entire job is warranted for 10 years against fabrication and installation defects. If you decide to sell your home, your warranty on Corian® is transferable to the new owners.